This is our Christmas tree. (Those are our Christmas goodies under our Christmas tree!) 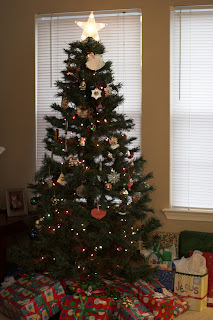 We put it up on Thanksgiving Day. Jared and I put the branches and lights on. I put the ornaments on, and Eleanor watched so intently. One of her favorite hobbies now is staring at the Christmas tree. I can tell she thinks it is absolutely amazing. Every morning, we have a little tree-lighting ceremony. I carry her into the living room, I count to three, then flip the switch that turns the lights on. She loves it! It will be a very sad day for her some time in early January when we walk right past the switch and just sit down for breakfast. I thought she'd be way too little this year to get anything out of the holiday season, but I'm glad to say I was wrong. While she can't recite the story of Jesus' birth or sing "Joy to the World", she is enjoying looking at all of the beautiful decorations. She has also had more than one lengthy conversation with a Santa Claus towel Nana sent us. I have thrown more than one crying fit about the fact that we will be here 'alone' for Christmas. Away from most of our family and friends with nothing to eat but my pitiful excuse for a holiday dinner. But I'm finally starting to get it. Instead of focusing on what I'm missing in Texas, I need to be thankful for what I have here- a wonderful, hard-working husband and a beautiful, sweet baby girl who both love me. I am so blessed! And I know Santa Claus can find us, even in Virginia. I feel for you being away from home. I can't even imagine how hard that must be. But know that here in Texas you, Jared, and Eleanor are never far from our thoughts and always in our hearts. I can't wait to see you all again! Thanks, Casey, for the sweet words! I love your blog, Megan. And your tree, as I would expect, is beautiful. Isn't it neat to see the world, especially Christmas, through a child's eyes? Jon loves the tree as well as we were careful to put ornaments at the bottom that he can touch. He especially likes the Christmas bell ornaments. He is too young to threaten (or bribe) with "Santa is watching" and I'm not sure how we'll handle the whole Santa Claus "thing" but it's fun none the less. We miss you so much. I need some new Eleanor pictures. She really is just so cute!